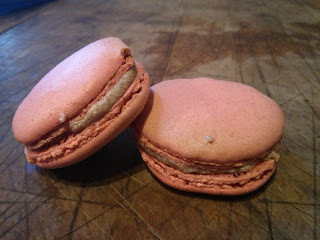 Travel Pennies: Homemade macaroons - the gift that says "Happy Birthday! I can't bake." Homemade macaroons - the gift that says "Happy Birthday! I can't bake." I've been a bit blue this week. Usually, at Easter time, my friend Naomi comes to stay. We lay around in our PJs, reluctantly go on walks and do a lot of baking. This works out well, because Easter is a time when people tend to shoot off in different directions. So I've been feeling the absence of Nomi this year, moping around and feeling generally sorry for myself. But then I pulled myself out of it, and decided to get baking anyway. To be honest, she only messes things up. Getting under my feet like an excitable puppy and making a gacky mess out of melted chocolate. There's no way my macaroons would have worked with her here. Actually, it's a miracle they worked at all. I've always thought they would be a bugger to make. There's so much precision and faff, which really isn't my forte. Plus? I don't really like them. They just seem a bit pointless to me, a bit poncey. Things that girly girls get excited about, and pay €18 for a box of 6 like a bunch of suckers. But it's my friend's birthday this week, and I always find it best to make something that I don't like. Especially because I was making these two days early. If I made something I loved? They would have been demolished within the hour. So I set to making macaroons. After a bit of googling, I settled on this recipe, from Eat, Live, Travel, Write I hit my first snag when it came to assembling my ingredients. I didn't have ground almonds or icing sugar, and neither did the local shop. What I did have was granulated sugar and whole almonds. Which meant I had to blanch, peel and blitz the nuts (snoooooooore) and make icing sugar. That was more exciting - one cup of sugar in the blender, with a teaspoon of corn flour in at the end. Homemade icing sugar! At last, I had assembled everything I needed. I pulled out the KitchenAid, only to discover the mother-effing plug had been taken off. This happens quite a lot in my house. The plug from one thing is taken and put on something else, in this case, the hoover. I had a couple of mini tantrums, before deciding that I wasn't about to let the appliance win. I was going to WIRE A PLUG. After I realised what this actually entailed, I turned to Youtube. Actually, I first turned to my friend's boyfriend, but he wasn't at home to talk me through it. So a gruff Yorkshire man helped me instead. And you know what? It wasn't that hard at all. I mean, I did put the wrong size of amp in there, but after someone on Twitter kindly pointed that out to me, I just did it again. So, really, I wired THREE plugs. It's oddly addictive. I now have the urge to take all the plugs off everything and switch them around. But I didn't follow that instinct. Instead I got on with the task at hand. You can find the recipe at Eat, Live, Travel, Write, who adapted it from Brave Tart. It's far too long to post here. I halved the ingredients, and ended up with 9 wonky macaroons. You'd probably get 10, if you did it properly. I filled mine with a normal buttercream (2 parts "icing sugar" to 1 part butter, and a couple of teaspoons of jam). The next time I make them, I think I'll make a chocolate ganache. I would also draw the outline of circles on the back of the greaseproof paper, so my circles are all even. I would also not burn them. Ahem. That's harsh Nic. But almost certainly true. You would have had to distract me with a squeaky toy mouse or something. Do you remember the disaster chocolate cookies??? As the recipient of the gift I have this to say - Laduree go to hell! There's a new macaroon baker in town! They were amazing. I think I enjoyed them even more knowing the extreme awkwardness Nicola had to go through to make them.